Pek is so money. But does he know it? The Timberwolves-less playoffs and Miami’s championship repeat. David Kahn’s departure and Flip Saunders’s arrival. The draft. The Vegas League. Free agency and welcoming Kevin Martin to Minnesota (and welcoming Corey Brewer *back* to Minnesota). Pek’s new contract. Rick Adelman’s eventual, inconspicuous announcement that he will return to coach another season. Media Day. And, most recently, the training camp and preseason. Beginning this week we can get back to the real stuff — the primary stuff. The games that actually matter. In Case You Missed Them: There are a ton of great preview pieces out there. Hardwood Paroxysm and SB Nation put together comprehensive collections of team-by-team previews. Kevin Pelton forecast the Wolves season for ESPN Insider. (SCHOENE!) Bill and Jalen recorded short videos for The Grantland Channel for each team, which have been highly entertaining and mostly insightful. Bethlehem Shoals posted 30 Teams, 30 Questions preview for GQ that you have to check out. And the great Britt Robson has commenced a three-part NBA Preview at MinnPost, to include a Wolves-specific piece on Wednesday. The bottom line is, if you want to be familiar with the issues facing the Timberwolves or any other team heading into the 2013-14 season, the information is out there for you. Here at PDW, we’ll outline the basic discussion topics and add our two cents on the upcoming Timberwolves season. As always, thanks for reading. Andy G: On the floor, the biggest question mark for this Timberwolves team is whether it can play any defense. Kevin Love and Nikola Pekovic can play post, position defense, but neither can protect the rim, and neither hedges hard on ball screens with any quickness. Last year’s defensive ace, Andrei Kirilenko, is in Brooklyn. Replacing his minutes will be Corey Brewer, an undisciplined but tenacious defender, and Chase Budinger, who is nursing a repaired meniscus and has never been highly regarded as a wing stopper. Kevin Martin, the new scoring guard, is not a good defender. In short, the Wolves will struggle to play defense at a league-average level, and if they don’t reach the playoffs, this will likely be the reason why. Patrick J: Agree. I don’t think the Wolves will be able to play defense at a league-average level, and I don’t know if their night-in, night-out, offensive firepower will be consistent enough to compensate for that over an 82-game season. And if they do make the playoffs, the defensive limitations are likely to magnified and picked apart, as they’re our key vulnerability. On a more optimistic note, what I can say is that watching Rubio and Brewer hawk the passing lanes makes up for the non-fun of watching Pek and Love (not) protect the rim. Hopefully they will keep enough pressure on the perimeter to induce other teams to have trouble getting good looks in the interior, because once that happens, it’s two points for the bad guys. Andy G: On one hand, the Wolves offense seems pretty well set in stone. You can pencil in Kevin Love for 20 to 25 points, with many of them coming from behind the free throw and three-point lines. Pek will put up 15-17 points from the low-block. And Kevin Martin should be good for 18 to 22 nightly points as a pure wing scorer, cutting off of screens and bombing from outside. Many of the scoring opportunities these men encounter will arise out of Ricky Rubio’s otherworldly floor vision and passing skills. Ricky has had stretches where his shot looks improved. Those are usually followed by horrific stretches of 1-for-9 stat lines that leave everyone wondering about his upside and the team’s with Ricky running it. If Rubio can become a 13 to 15 points per game scorer in ways that demand respect from opposing defenses, the Wolves could have one of the best offenses in the league. Patrick J: I agree with pretty much everything you said, so no need to repeat it. To throw in a wrinkle, I’ll posit the following: If the Wolves struggle offensively early in the season, even if only for a two or three-game stretch, I won’t be shocked to see them largely jettison the offense and revert to pick-and-roll land like they did last season. It’s their comfort zone, and moreover, it isn’t clear that the players have really bought into Adelman’s offense yet; nor is it objectively clear that they should (as you suggest above by asking, “Can an offense like this work in the 2014 NBA?”). I think the offense can, and probably will, work fairly well–the team has a strong coach and the right personnel to run it. But I won’t be surprised if Rick has a short leash early on, and pulls guys whom he thinks are freelancing too much. The one thing I fear this year, offensively, is that Pek isn’t as productive as in previous seasons. There are a few reasons. The first is Kevin Martin. Sure, Pek will get plenty of looks off of Rubio plays, and maybe a few high-low dump ins from Love in the high post, but the team can only take a finite amount of shots per game, and I think Kevin Martin is going to eat up a TON of those, mostly at Pek’s expense. (Whether or not that’s good or bad for the team remains to be seen–I’m agnostic at this point.) In the preseason, it didn’t look like Martin and Pek synced particularly well on offense. I know this is going to sound like a stretch, but I just don’t see Martin generating any offense for Pek, even by drawing defenders, since he isn’t a great passer, so you might end with Pek being a third wheel too often, unless this team ends up moving the ball far better than I anticipate. Second, Pek admittedly wasn’t in the best shape in training camp and the preseason because he didn’t do much this offseason whilst he waited for his contract situation to be resolved. I don’t think this’ll end up being a huge setback–he’ll get in shape eventually–but I do see it as an increased injury risk in the short term. And if Pek would go down, you’re looking at a very ugly offensive duo of Turiaf/Dieng replacing him. That would result in some very ugly possessions. Andy G: I analyzed the potential playing rotation after Chase Budinger tore his meniscus. (Again.) Things have changed slightly since that time, with evidence gathered from preseason games, insider reports, and marginal roster decisions. The Wolves four horsemen (Rubio, Martin, Love, and Pek) will play the bulk of minutes at the 1-2-4-5. Any rotation questions, then, are focused on the bench and starting small forward positions. Corey Brewer will probably start, in Budinger’s absence. But that’s not ideal and Adelman (more or less) acknowledges this publicly. Brew is the proverbial “energy guy off the bench” if there ever was such a thing. In a starting lineup that features at least one All-Star scorer, Brewer’s aggressive-bordering-on-erratic style might be more of a distraction than injection of needed speed and energy. It’s been described as a “fluid” situation, which basically means they haven’t figured out who the starter is. The bench is split pretty evenly between question marks with upside, and known commodities without it. In the early part of last season, Alexey Shved appeared to have star potential as a playmaking guard. It didn’t last, and he played terribly down the stretch of the season. J.J. Barea — Shved’s chief competitor for backup guard minutes — plays a visually unpleasing style of hero ball, but he’s tough as nails and can be counted on for drawing charges and scoring in bunches. Which one plays will largely depend on Shved: If he figures out how to navigate physical ball-screen defense and avoids late-in-the-clock dribble jumpers, he’ll crack the lineup. The “caged lion” found himself in the seemingly-ideal position of needing to fill the role of go-to scorer. But he couldn’t do it. He never found that gear. Many seem to think it’s a gear that exists nonetheless. This apparently includes the front office that just picked up his $6 Million-plus extension for next season. Williams will battle for playing time against Dante Cunningham, a pro’s pro in terms of how he approaches his role and its duties. For a power forward, Dante is quick, but undersized. He’s on the “fun to watch him play defense” list, along with Rubio and Brewer. But he cannot carry a team offensively; it’s jumpers at the elbows, pretty much exclusively. Between these two, I lean heavily toward Cunningham, but hope to be majorly, and pleasantly surprised by Williams — and that’s whether it happens for Derrick here, or elsewhere. Talent squandered is never something to cheer for. Last but not least is the backup center position. In the offseason the Wolves drafted Gorgui Dieng in the late first round. He’s athletic with shotblocking instincts. They also signed Ronny Turiaf, the NBA journeyman who in recent years has figured more prominently for his towel-waving and good-guy locker room presence than anything on the floor. Ronny can defend the post, but he is nothing to get excited about as a basketball player, at this point in his career. I expect Dieng to earn backup center minutes as the season moves along. Patrick J: These are the big issues. I’ll take them in order, then add one. Starting SF: I’d go with Brewer. He’s the best player of all the realistic candidates. I’d never go with Robbie Hummel, who started a couple of preseason games, and didn’t shoot well. I wouldn’t start Shabazz Muhammad, but I’d give him the minutes Williams will inevitably get. Like Hummel, Muhammad already looks less likely to do things that will cost you games, and given the same amount of time, I’d be very surprised if he didn’t end up getting as many garbage buckets as Williams. He rebounds more aggressively, especially on the offensive end. And my initial impression is that Shabazz’s defense is far from sterling, but isn’t nearly as poor as his naysayers are claiming. Shabazz looks like he knows he screwed up in his time at UCLA, and he knows he needs to make amends. So, he’s playing really hard, and very unselfishly. He’s playing within himself, and thus not making all that many plays, but not a ton of mistakes, either. Williams looks like the exact opposite. He knows he was great at Arizona, and is expected to be a very, very, good NBA player because he was drafted high. So even though I think he’s trying to play hard, everything he does is forced and over-thought. Unforced errors abound. He thinks he has to be a scorer, so he focuses on scoring and neglects to try to become a high-level rebounder. Ultimately, the proof is in the pudding, and I won’t be surprised if Muhammad starts taking some of the SF minutes after Williams continues to prove he doesn’t deserve them. That might not happen if Chase Budinger’s injury heals quickly, but if it doesn’t, I think he cracks the rotation by late December. Bench rivalries: I really hate rotations where J.J. Barea is the point and Alexey Shved is the two. We seem destined to see quite a bit of that this season. I want Alexey to succeed because, frankly, as a fan, I like him better than J.J. Shved has a cool about his game that I dig on. He really seems to struggle when he’s playing alongside J.J., possibly because J.J. is so ball-dominant, and Alexey’s bread-and-butter is creating off pick-and-rolls he initiates at the top of the key–a play he’s rarely in a position to initiate when J.J. is running the point. Shved’s bad shooting–and it can’t be called anything nicer than that–will have to improve, or there will be no justification for putting him on the floor at the point or at any other position. I was more optimistic before the preseason than I am now that this will happen this season. Fingers crossed, but for now, if I were Adelman I’d shorten up my rotation and give almost all the guard minutes to J.J., with him at the two when Kevin Martin sits and Rubio’s in the game. Based on what I said about Derrick Williams above, I think you already know my stance on giving him minutes versus allocating them to Cunningham. I like both Turiaf and Dieng. Turiaf will get almost all the backup minutes to start the season, which will go to Dieng after one or both of Pek and Turiaf suffer injuries. Ultimately, I won’t be surprised if Dieng ends up averaging 15-18 minutes a game and making small but important contributions. 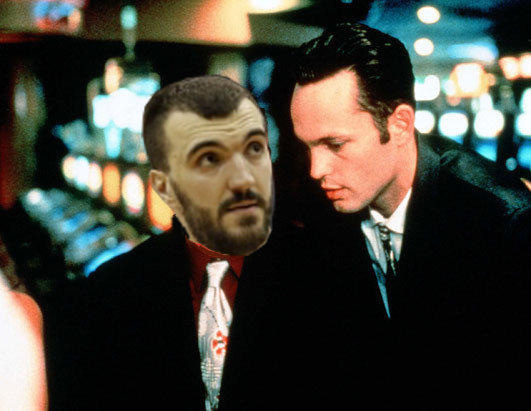 Andy G: There’s a famous scene in “Swingers” that applies to these Timberwolves. The guys are out on the town when Mikey spots an attractive woman at the bar. He approaches, orders himself a drink, (“And some more olives for… for our little friend here”) tries his hand at some small talk, and… inevitably makes a fool of himself. Mike is [sort of] newly single and not yet comfortable in the dating game. But more than that, he’s a “nice guy.” Too nice. What, you ask, does this have to do with the Timberwolves? In the current NBA landscape, the Timberwolves are Mikey. They are League Pass darlings. They have a Spanish Unicorn and a Crossover Panda. Nikola Pekovic, often the subject of jokes for his ridiculous muscles and generally scary appearance, actually seems really friendly. It’s an identity thing. You know it when you see it. Teams with Kobe Bryant or Kevin Garnett or Chris Paul or Dwyane Wade or David West or Joakim Noah… they have it. The 80s Pistons had it, but maybe took it too far. You may not always like how it looks, but you’d damn well rather have it on your side than your opponent’s. I’d like to see a harder edge to these Wolves, beginning this year, even if it comes at the expense of their League Pass Loveableness. They’ve got the claws. Now it’s time to kill the bunny. Since you zigged to movie references, I’ll zag to music references. Specifically, songs by one of my favorite all-time musicians, Elliott Smith, which animate a bunch of recognizable trials and tribulations related to our experiences as Wolves fans. So, here’s a quick little ditty. It isn’t comprehensive. Smith made too much music whose themes, or titles, are apropos of the history of Timberwolves Sad that we wish weren’t true but is. The music is pretty great in its own right, but it also goes far in explaining why the Wolves have been, well, “punch drunk,” since roughly mid-2005. This song is about betrayal, forgiveness, and what might have been. That reminds of wayback–KG and Starbury. It’s sad that what began as a great friendship, and a great basketball foundation, fell apart. And no matter what either said or says, you know that they regret how it all went down. So do I. What a shame. This song makes me think of a lot of things. But applied to the Wolves, it makes me think of the break up of the organization and Kevin Garnett. This is post-KG. “Needle in the Hay” represents the Wolves eternal unsuccessful search for talent of the low-risk, high-reward, variety. Grasping at straws. Self delusion. Think Mike Beasley. Anthony Randolph. Gerald Green. Sebastian Telfair. Michael Olowokandi. Ndudi Ebi. Another allusion to the Kahn period. A meditation on the shallowness and depravity of transacting in a cold, mean world. The title sums up the story pretty well, but for Wolves fans, the following passage is reminiscent of Kahn’s trading frenzy on draft night in 2011, in which Kahn made a flurry of moves all night long, which included giving up future NBA star Nikola Mirotic to the Bulls, in order to funds the money necessary to buy out the current coach and Kahn adversary, Kurt Rambis. It was clear that night that Kahn knew that night–probably rightfully so–that he was mortgaging the team’s future to save his own skin. That was the David Kahn era, mmm-hmm. Andy G: We were going to throw in some predictions, but as we found out the hard way last year, those are just one set of knuckle push-ups from being thrown in the scrap pile. Here’s to a healthy 2013-14 season. Great Work guys, as always. Gonna have to go watch Swingers now. Hey, thanks a lot, Jake, and good call on (re?) watching Swingers. It’s a classic. Ditto what Andy said – you can’t go wrong with Swingers.